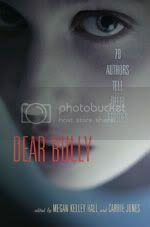 I couldn't help but notice that that cover for HarperCollin's upcoming anthology Dear Bully: 70 Authors Tell Their Stories looked awfully familiar. 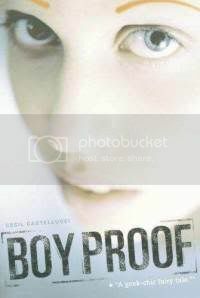 It's the same picture from the cover of Boy Proof! And then, I wondered if this might be the same model from the cover of The Declaration. It's the year 2140 and Longevity drugs have all but eradicated old age. A never-aging society can't sustain population growth, however…which means Anna should never have been born. Nor should any of the children she lives with at Grange Hall. The facility is full of boys and girls whose parents chose to have kids—called surpluses—despite a law forbidding them from doing so. These children are raised as servants, and brought up to believe they must atone for their very existence. Then one day a boy named Peter appears at the Hall, bringing with him news of the world outside, a place where people are starting to say that Longevity is bad, and that maybe people shouldn't live forever. Peter begs Anna to escape with him, but Anna's not sure who to trust: the strange new boy whose version of life sounds like a dangerous fairy tale, or the familiar walls of Grange Hall and the head mistress who has controlled her every waking thought? Whoa! That's what happens with stock photography I guess. I know it's expensive to do a photoshoot so stock photos are the much more practical option for book covers, I just wonder how much research they do on other book covers to see if an image has been used before. It's probably impossible to know that, but I just find it odd when book covers are as similar as the ones above. Same image is one thing, but similar color scheme as well? Nice catch Madigan! I know! It's kind of serendipity that I discovered the third one... I was looking at some older reviews and noticed how similar her eyes and the divot under her nose were - it's got to be the same person. That really does look like the same model. 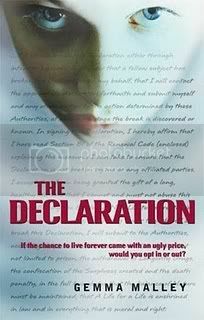 The Declaration sounds a lot like the Shadow Children series by Margaret Peterson Haddix. It is similar to The Shadow Children, in that it's a dystopia where children are limited, but it's different on several key points. In The Shadow Children, 2 children are allowed, and it's 3rd children that are illegal. In The Declaration people aren't allowed to have children AT ALL, because they have achieved near immortality. You can sign away your rights to future medical treatment and inevitable death if you do want to have a child, but that is very, very rare, and people who do so are regarded as suicidal freaks. The kids at the orphanage in The Shadow Children are fearful of being caught out as third children, but they do feel they have a fundamental right to exist. They feel the laws are unjust. In The Declaration, a big part of the story is whether or not Surplus Anna will ever get over her feelings of utter worthlessness. Yup, that looks like the same girl. It kind of bugs me when they do this. I understand why, and often the cover really does work but....it's so unoriginal. I really like it when a cover connects strongly to the book. How am I supposed to buy into a cover picture of one of the main characters if I already know that girl as another character? I think it's neat. I like seeing how different artists use the same material (in this case, a stock photo) in different ways. It does look like the same model. Are you going to do Cover Twins as a meme? It's a lot of fun to see different covers.